It’s been a beautiful day and I’ve had so many great conversations with people. Sometimes that alone, even if I haven’t done that much in business, I’ve had a productive day, but not typical. I wanted to do some writing, for example, and I didn’t get to do that, but I’ve had incredible conversations with people. I don’t know that there’s anything more important than that. It’s the most fundamental thing to me and we all believe this and maybe we don’t always live this way, but we certainly believe it on the inside that we crave connection. The most important thing that we can do is to connect to our higher selves, to connect to our authentic selves, and to connect to other of our divine beings, the reflections of our self in other people, our brothers and sisters. I feel so lucky to have been able to do that and yet can do it now even with a brother, a friend, somebody that I’ve known for several years now. We met at a TLC, Transformational Leadership Council retreat some time ago and this gentleman is a class act. He’s an amazing man. He’s an amazing father. I got to meet and get to know his daughter as well, she is a divine reflection of Ken and his wife. Ken is in Japan and through technology, we get to be here together. Wherever you are right now, consuming this content, I’d invite you to take a deep breath and slow up for just a few minutes and enjoy this time. We’re going to enjoy together. Ken and I are going to have a conversation and enjoy our time together and we invite you to be a part of that. I’m going to breathe more deeply, more slowly, and more consciously now in this moment to feel so grateful and cultivate that feeling of gratitude right here, right now in my body, in the present with a good friend. Ken Honda began his career as a successful business consultant and an investor. He retired at the young age of 29 and spent the next four years raising his newborn daughter. During this time, Ken had a vision of becoming an author. He picked up his pen, and with a new-found passion, began to write. He would soon find himself traveling around the country to speak about money, happiness, your life’s purpose, and finding your gifts to audiences of more than a thousand people at a time. Since 2014, he has been speaking on the world stage and has started writing his first major works in English. 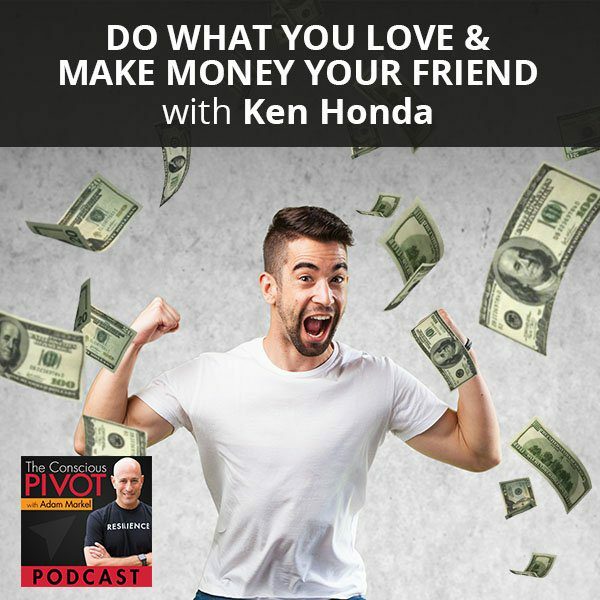 His popular weekly podcast Ken Honda’s Life Advice Column: Dear Ken celebrated receiving more than 30 million downloads on iTunes. With more than 110 books written to date, his major bestselling series, such as The Millionaire’s Philosophy for a Happy Life and 17 Things to Do in Your 20s, have all helped Ken sell more than seven million books across Japan. Ken signed a contract with Simon & Schuster, which is our publishing house as well, for his first English book. Ken, thank you so much and welcome to The Conscious Pivot Podcast. Thank you, Adam. I’m so honored to be here. This is one of those moments where I can see how time and space just collapse. When I use my computer in United States, when I am seeing something in my document, it says tomorrow when I saved something. it’s interesting how the time works, but thanks to the technology, I can almost touch you, Adam. We’re living in a Sci-Fi movie. From the time when you and I grew up, this was stuff for comic books, right? Yes, so true. Thank you for sharing your time with me. Ken, you have an incredibly impressive bio. You’ve done a lot of amazing things in your life and in a short period, too, because you’re a young man. What’s not written in this bio that you would love people to know about you? Probably a happy husband, a happy father, even though my daughter is going to turn twenty soon this May. I retired for my baby girl but I’m getting kicked out of my career as a father. I know Hannah and she will never kick you out of that career. Probably I will write more books because I’ll get lonely. Ken, if you could share anything at all that you’d like to about where your business began or where your personal pivot or your business pivot started. I was a very unique student in college and I wanted to be an entrepreneur, so I started my business. Consulting mostly and accounting when I was about 22. I retired at the age 29, which is early because my investment did well, so I could retire young. When I found out my wife was pregnant, we decided to take a year or two off. Once you retire, your thinking is slow and you speak slower. My friends were all surprised that I speak like an old man. That retirement was extended to four years. I was walking in the park with my daughter, who was two or three at the time, and I got this vision of writing a book, which was bizarre because I was a law major student. I was doing accounting. Writing is not something I do. This image kept haunting me for days, so I started something for my friends. I started giving away my 26-page booklet that I made. I copied them, gave them away and my friends love them. I had nothing to do. Every day I staple ten copies, twenty copies and I got tired of just doing staples. My friend asked me, “Do you know a printer? You can print 200.” “That’s a good idea, so I’m free from stapling.” Then I asked a printer to come and then I just said, “200.” They don’t do 200, 500 is minimum. I asked for 500 and he said, “500 or 1,000 copies, it doesn’t make much difference. it’s just paper.” I said, “1,000.” He’s a good salesman. He said, “1,000 or 3,000? That doesn’t make a big difference.” I said, “Okay.” I ordered 3,000 copies of my booklet on Happiness and Money. Then a few weeks later, two trucks came in front of my house and started unloading stuff and I asked them, “What is it?” He said, “It’s books.” Then I panicked that those were the books that I ordered, so I emptied my room out and then put all the books boxes in. Then I promised my wife that I’m going to get rid of the boxes in two weeks. I went crazy giving away my booklets. People liked my booklet so much. I got a backorder of another 3,000 by the time I got rid of the first 3,000. Then I started giving away my booklets. By the time I gave away 100,000 copies, a publisher called me and said that they’re interested in doing a book with me. You gave away 100,000 copies of a 29-page booklet? Yes, which I’m also giving away now in English. I’ve given away about almost 2 million copies now. What was the biggest takeaway that people were saying they were getting from the book? Their view on money and life got totally transformed. Before then, money was an evil enemy, but now money became their friend. You can make peace and let money help your life instead of money attack your life. Do What You Love: You can make peace and let money help your life instead of money attack your life. How did the thought to write about money and happiness come to you? What was it that inspired you to write about that? I have had great mentors. One of them is a Warren Buffet of Japan. He is one of the richest investors in Japan. His name is listed in the owners of public companies for more than 100 public companies in Japan. Somebody like that taught me what money is. I was very lucky because I can retire very young. One time I’m in the park, I spent almost all day in the park when it was sunny. There is this young mother who was dragging her daughter and she was saying, “Your mom got to work so you have to come with me.” She was crying. She wants to play more. I felt so much pain. Because of work and money, they cannot have a great moment. If she had more knowledge about money and work, she could be there as long as they wanted. I got this inspiration that maybe if I could share my ideas about money at work, they can achieve the ideal life, which wasn’t so easy, but at the time, I thought that’s a great idea. This is some time ago, I don’t know if you remember exactly what you did, but do you remember how you began? I just sat down and wrote one of the things I wanted to share with the world and that is the real key to happiness. It’s knowing who you are. Most of us are so lost in everyday life. We don’t know why we’re born on this planet, we don’t know what we are good at, and we don’t know what we’re supposed to do. If you know who you are and what you’re supposed to do, at least you’re happy even though you may not have money, but happiness is guaranteed. What can you do to finding who you are? My answer is doing what you love because I’ve discovered over the last twenty years, the gift you’re born with, there’s also a greatness to see to make you financially independent, too. If you do what you love, you’re likely to succeed at least a few times more than doing the work you don’t like. Adam, you used to work as a lawyer and you must be very good at it but somewhere, your heart was not there anymore. No, my heart wasn’t at a certain point. That’s a big thing for a lot of people is that they start out in something. Usually they’re doing it because they don’t know what else to do at the time and they still have to pay their bills, they still have to pay the food, the rent, and car. Before you know it, you blink, you close your eyes and open them again and it’s five years. You close your eyes and open them again and it’s ten years go by. People find themselves in a career or in a job or situation that they don’t love, and they don’t know what to do about it. A lot of the people that are part of our community, this pivot community, are many people who are reinventing themselves. They’re reinventing their businesses if they’re entrepreneurs or their careers if they’re employees to find something more that will bring them the happiness that you’re speaking about. 95% is identical here. Most of us want to find meaning and at the same time, make a comfortable living. Not super rich but comfortable enough to send their kids to whatever their university is. Not a gorgeous life. You don’t have to have four houses but do what you love and still support your family financially. That is a baseline. After about writing my first book, I kept on writing. My second book is Money IQ, Money EQ. The third one is Do What You Love! Money Will Follow. I have done so many books on supporting people financially by doing what they love. In the process, people find happiness in money. There’s a lot of people, too, that will resonate with what you said about the way you began your book. It was to ask the question, “What do I want to share with the world or what’s the message that I want to convey to the world?” There’s a lot of people that have a book inside them and know it. They know there’s something they would like to share and even write but have not been able to get started on that. You’ve done 110 books as an author but you’re also a publisher as well. Is that right? I’m not a publisher but I work with four or five major publishers here. I don’t have a company. At one point, you must have decided I’m no longer retired. When was that? When the publisher came to you and said, “I want to publish your book,” when did you officially go where I’m no longer retired? I had a dream. It’s a weird dream when my daughter was two or three at the time that she was a teenager with a very rebellious attitude and then she’s telling me, “Dad you may have money, but where is your soul?” I woke up and that was a very real dream. I realized if I kept on going as an investor and not doing anything to help people, I’ve been probably embarrassed to talk about my work to my daughter. I thought, “I want to do something to help people help the world. At least my daughter can be proud of me.” That was probably like a pivot point for me. Respect for my daughter and also my wife, which I always have, is a big deal for me. You and I have something in common as well because when I decided that I wanted to write a book, it was interesting. My dad is an author. He’s a fiction writer. I grew up in a house with my dad typing on a typewriter and listening to music at night because he had a full-time job in the day and would be writing at night, typing and mostly editing tons and tons as you know. I never considered myself I would ever be a writer of any kind because that was his thing and I was going to do my thing. I think a lot of times that’s what we do as we decide either we’re going to be very different than our parents for whatever reasons or we’re going to be similar to them and I had decided I was going to go my own way. I realized that the things that I’ve been learning that were pivotal in my life were things I wanted to share with our kids. I started writing something that would be a guide for the kids, for Chelsea that you got to meet. For her siblings, Lindsay, Max and Eden. It began that way. My daughter, who was not two and a half like Hanna, was when you started writing. Chelsea came into my room one day and she said, “Dad, I think what you’re doing is great, but I also think it’s bigger than US. It’s what you’re doing and what you want to share is more for the rest of the world as well as for us.” That caught me by surprise and the focus of what I was doing the writing for it had changed like that. We all learn from our kids. Teachers and mentors who shed lights our life. It’s important that we have something that reflects back the truth because when we look in the mirror, when we see ourselves, we don’t always see the truth. We see things that are a product of our self-image that we’ve cultivated and much of that are thoughts and programming from other people. It’s not necessarily the truth. Out of the mouths of babes is the expression. They say things that are very truthful. Kids are the lie busters. They can detect a parent’s lie in two seconds. Whenever my daughter says, “Do you have a moment?” I get nervous. At the same time, it’s a great learning experience for me. Do What You Love: Kids are the lie busters. They can detect parents lie in two seconds. That indicates you’re such a great father because if you’re a trainer, they cannot say anything to you. You changed your life, you came out of retirement, and you started writing. What’s significant there is the way that you began, which was that you were making an offering to people on your community. You wanted to share this information with them. It didn’t have to start out with, “I’m going to be a bestselling author,” or “I’m going to sell a lot of copies,” or “I’m going to get rich,” or anything like that. It came from a place of service. The whole twenty-year experience of mine is an experiment. If one man decides that he’s going to change the world, how far can he go? This has been my wife’s experiment, how one person or one couple can impact the world. I wanted to donate $1 million to charity but instead, I thought of printing my books and give them away. I gave away two million copies. It costs about $1 or $2 to print. Shipping was also free. I spent about probably $2 million for a gift. I wanted to show the world how serving is the best way to financial independence. I was already financially independent when I started, but I gave away two million at the beginning. I sold almost eight million copies. I made more money a few times over after giving away. Giving away, sharing, and offering is the best way to abundance and going to the world. It’s fun. It’s such an interesting thing, the idea that there’s a return that comes from giving, but you can’t give with the expectation of a return. It has to come from a place of purity, pure heart. There is a testing moment at one time. All the cost of shipping and printing reached something like $80,000 a month. At the rate that it’s going, I thought I was going to go bankrupt but I thought, “I’ll just keep going all the way until I go bankrupt and let the tabloid right about me, “A happy guy went bankrupt by giving.” What’s interesting is that people started to donate money and the company I invested went public and somehow the money just kept flowing. There’s a beautiful description of this principle in the Bible. I’m not a religious person or very spiritual. l love the Bible for spiritual inspiration. As books go for that, it’s a pretty good one. I love the story of how in the desert, after the exodus, after Moses leads the Jews out of Israel and they’re in the desert, there is a statement that, “Enough will be provided, the Manna will be there. Don’t hoard it, don’t save it because there’ll be enough. There will always be what you require.” That is very much a philosophy or a belief system around abundance that many people do not have, that what is required will be provided. People hoard so much for lifetimes whether it’s money, houses, cars, whatever it is. In that beautiful story in the Bible, the people who decided to not listen to that advice and they instead hoarded the Manna for the next day or for five days, they became poisoned. It became a pestilence because there would be enough and then they hoarded and it turned bad. It’s a wonderful lesson and something everybody has to check for themselves. How much do they require and what’s it for? None of it goes with us. You can’t take any of it with you. You never pivot once in your life or my life or career or personal things, it’s an ongoing thing. What’s the next pivot look like for you right now? I know you’re doing a book in English as an example. Janet Attwood, she is the creator of The Passion Test. She came to Japan and she said, “Ken, you have to go international.” I asked her, “What do you mean?” She said, “You’re doing so many works in Japanese. Why don’t you go outside?” I said, “I’m a happy camper in Japan.” I don’t like flying around and I want to spend as much time as possible with my family because she’s going to leave us anytime soon. Janet said, “The world is bigger than you think.” That was the moment of a new pivot in terms of taking my work internationally. I never thought of even doing that. I was very happy. What does it look like for your work to be taken internationally? After joining a TLC meeting, I got this idea. The work I teach is universal because all of us spend money and all of us struggle with work, with families, with couples, with friends and most of us are lost, too. By helping other people, I feel this is my path, too. I can help somebody in Africa, somebody in China, in India, in Europe and in America because we all deal with money. What I discovered is that there are two kinds of money in the world. Love money and fear money. There’s a flow of love money, which is like a ten-year-old boy giving a string of rose to his mother on Mother’s Day. That’s love money. Poor family donates little money to the other poor people, that’s love money. The fear of money is that when you spend it, you know it because you feel so scared and when you want to spend it, it’s also scary too. My mission is to create a flow of happy, loving money in the world. There are many readers who understand very much the feeling of scarcity. They also have had experiences of abundance as well. More often than not, they lean on scarcity. They lean back, especially when there’s some uncertainty or they don’t know how things are going to turn out with the business. Do you have some suggestions or some distinctions between what represents scarcity mindset around money and what represents abundance mindset around money? Money has nothing to do with it. It’s more of your trust issues with your life. When you worry about money, it’s not the money. It’s your future that you worry about. In your future, the work may not do well or some things may not go as well as well as you imagine. It’s nothing to do with money. It’s more of trust issues. I teach people how to trust themselves and more. When you learn to do that, your worries, anger and frustration in money are gone. If you stop worrying and feel scarcity in your life, that’s nothing to do with money. I want everybody to let go of money. Money not guilty. Money is not the culprit. It all comes back to whether you yourself are trusting of yourself and of the universe. You may have guilt or feelings that you are going to be punished or that somehow there’s a bad karma or some other thing that’s in play as well. Money could be a great teacher because it brings up the best and the worst in you. It’s a magnifier of sorts. It gives you a good lesson and that’s the only thing that functions. If you are clear emotionally, that is a good start. My mentor, Wahei Takeda who is called the Warren Buffett of Japan said, “There’s only one thing you need to know about money.” I asked him, “What is it?” He said, “Just appreciate the money as a person so when the money comes in you say, ‘Arigato. Thank you for coming in.’ When the money leaves your life also say, ‘Thank you for staying with me. Even though it was a short visit, I enjoy being with you.’” If you start appreciating when it comes in, when it leaves you, you choose to live in the cycle of happy trust in money. Do What You Love: When the money comes in, say arigato or thank you. When the money leaves you, when you spend it, you also say thank you, arigato. Your mentor equated the relationship with money to relationship with people? Yes, because nobody wants to be controlled. Usually what people do is when the money comes in, they just hang onto it, “Don’t leave me.” It’s usually a bad thing to do in a relationship. Similar to hoarding the Manna, it’s when you hang onto it that way, you’re coming from this place of need and of neediness. Nobody wants to be around anybody that feels that person’s neediness. People are so afraid. That’s why we’re also afraid with money, too, because we think money brings us security. The real security is in relationships. When I do a big seminar, I ask people, “How many of you have friends who can let you stay for more than a week?” Pretty much everybody raises his or her hand. “How many friends do you have?” Some people have three, some people have hundreds of friends. “If you have more than 50 friends, who would let you stay with them for free? You are financially free because after about a year, you’ll come back to friend number one.” That’s the key. I have many friends who are already successful, who are winning to help me, so I’m not worried about anything because they’re going to take care of me. It’s a relationship that you create. It’s not how much money you have. Even though I lost everything with lawsuits or whatever, I’m not worried because I can write a book on 17 Things I Learned from Bankruptcy, How to Enjoy Your Life Through Bankruptcy or stuff like that. Also I can have so many friends help me out. If you know that all the people around you are willing to help you out, you don’t have to worry about a thing. Relationships are at the root of the solution. Relationship is not something that everybody’s very good at. You are incredible teachers, both of you. I admire you as a couple. You have a beautiful relationship. I always think it’s so great. Thank you, Ken. Randi and I, we found this love to teach, more importantly to share, what we’ve experienced in the area of relationships, our relationship and relationships with our kids. We’ve enjoyed sharing that information with people and it’s been fun. It’s an ongoing learning for us. We’ve had teenagers, we have two older daughters that are in their twenties, and still have two teenagers, a daughter who’s seventeen and a son who’s nineteen. We’ve come through the hardest parts of it. We got out of the rocky place. Whoever the president is, he or she should give you a medal. It is so hard not only in the US, to keep family close and happy that’s worth a medal. With the divorce rate that’s above 50% still, which is a very high rate, the relationships are something that would make sense that we were teaching and working with kids earlier on in their lives. It’s more of a curriculum that would be suited to elementary school, early education. Wherever we’re at, there’s no question that we have to work at relationships. It’s not something that we just take for granted or you do in your sleep. We have to be very conscious and intentional about what we do to care for people. If we think of money as something similar to a relationship we have with a person and we care for it, we respect it, we honor it, we are grateful for it, we say goodbye to it, but even when we say goodbye to it, it’s done with love and with respect. This is a very different way to frame what money means and what it is as opposed to the way a lot of people had been brought up to see money or experience money as something that’s lacking, missing, that we struggle for, that we work hard for, that we sacrifice for, that we give away the best years of our life for, that we lose, that people take or steal from us. There are a lot of other things that are mixed in on the emotional level with that topic of money. Framing it the way you have in the way your mentor shared with you, that’s very different. It’s beautiful. North American people and European people would benefit from what I learned because it’s a mixture of Zen and very esoteric tradition of Japan, that we believe there are eight million gods. We believe that God is in each one little thing, even if it’s an object. That’s an interesting concept. We treat money as a friend. That is the best way of doing it. I recommend everybody, it doesn’t cost a penny, when the money comes in say, “Arigato or thank you.” When the money leaves you, when you spend it, credit card or cash, you also say, “Thank you or Arigato.” You’ll feel good either way when it comes in or when it leaves. What’s interesting is that your income grows. Try that. It’s a fun experiment. You’re not going to lose anything. You just feel happier. It’s going to be a great way to have this conversation similar to the one we’re having, but I assume the book will deal with a lot of the same topics and more so. I’m just struggling every every day. To get the book written? I never had an English education, so I learned via radio. This is the biggest struggle but doing it is more fun than struggle. Are you writing it in Japanese and then translating it to English or are you writing it in English? I’m writing in English. I’m embarrassed to say but every line, my editor corrects something. I am very humble. I know already you are a very humble man in the best ways because you’re gentle and a good soul. We know each other just a couple of years, but you are a good soul and I respect you. You’ve done wonderful things. You continue to do wonderful things in the world, Ken. Thank you for that. Thank you so much. I’m enjoying every minute of it. I will do the same even if I don’t get paid at all. I’m thinking most of the work I do, I’m going to do it for free because when I teach happy money concept to people, I don’t feel like charging people. I’m already financially independent, so I’m going to create many online courses and movies. I’m thinking of making everything for free, so anybody can access. This is what I love about the podcast world as well is that this is free content. We’re all spending time doing this. We work at it, spend time, put our love and our energy into it, and put it out there into the world with no strings attached, no financial exchange, no quid pro quo from my lawyer days, none of that. Is there a ritual or a practice that you have that helped you to stay being the best that you want to be? Whenever I meet somebody, I secretly say in my mind that all the great things will happen to this person from now on and he or she will be blessed so much. Before I go to sleep, I think about those people I met, or I interacted or I’m imagining readers of my book. There are usually a few thousand every day. I imagine young ones, old ones, the happy ones, and the not so happy ones and I pray that their life will turn out good for them. That’s what I do. Those things are very secretive, so I usually don’t tell but that is something I recommend if you feel like doing it. It’s more fun and that brings you peace of mind, too. Thank you for being here. If you haven’t subscribed yet, you can go to AdamMarkel.com and subscribe. Please also leave a review on iTunes. We love the reviews. We love the feedback. We also have an incredible community that is expanding, Pivoters, people who are reinventing themselves, reinventing their personal and business lives in so many ways and you can get access to that on Facebook by going to Start My Pivot Facebook Community or go to PivotFB.com, which is the shortcut to that front door. As we close out this session, we’re not ending anything, we’re just beginning. I get to do something that gives me great pleasure and it fills my heart with a lot of love and that is to wave my magic wand as I get to end our podcast with a wish, with a hope, and with a prayer. That prayer is that Ken, that you and I and everybody that is out there in this moment will wake up. Everybody will wake up tomorrow. We all had the blessing of having a new day, of waking up to a new day. None of us are guaranteed that tomorrow. When you do realize that you are taking that first conscious breath, that first aware breath of the day tomorrow, recognize that there are people in that very moment who were taking their last breath and that makes that moment sacred. There are babies being born that are also taking their very first breath of life. It is a holy moment when that happens. For you in that moment, as for me, recognizing that means we’re a little bit more conscious and we can be grateful for that. Part one is that we wake up. We’re all going to do that tomorrow, all of us. Part two is that we’re going to cultivate some feelings of gratitude in that moment. The last part, the third part, if you feel like doing this from your bed or when your feet hit the floor, you can declare out loud these words. “I love my life.” I wish you all a beautiful, blessed rest of your morning or evening or wherever else in the day you might be. We’ll see you very soon. Ciao for now. 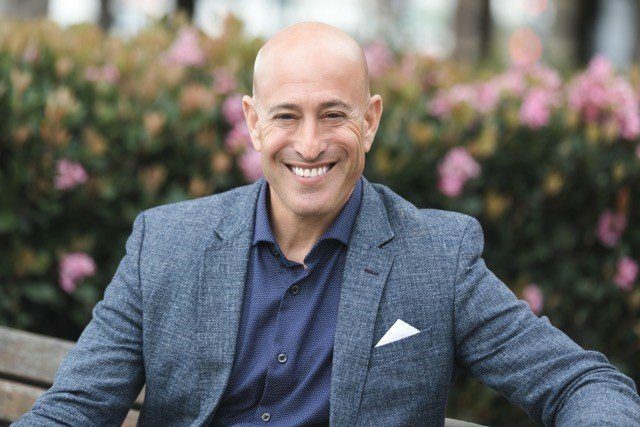 Ken began his career as a successful business consultant and investor. He retired at the young age of 29 and spent the next four years raising his newborn daughter. During this time Ken had a vision of becoming an author, and picked up his pen with a newfound passion. He would soon find himself traveling around the country to speak about “Money & Happiness,” “Your Life Purpose,” and “Finding Your Gifts” to audiences of over 1000 people. Since 2014 he has been speaking on the world stage and has started writing his first major works in English. His popular weekly podcast “Ken Honda’s Life Advice Column: ‘Dear Ken’” recently celebrated receiving more than 30 million downloads on iTunes. With more than 110 books written to date, his major bestselling series such as “The Millionaire’s Philosophy for a Happy Life” and “17 Things to Do in Your 20s” have helped Ken sell more than 7 million books across Japan. Ken signed the contract with Simon & Schuster for his first English book. His book will be published over 20 countries including US, Europe, Asia and South American countries in 2019.